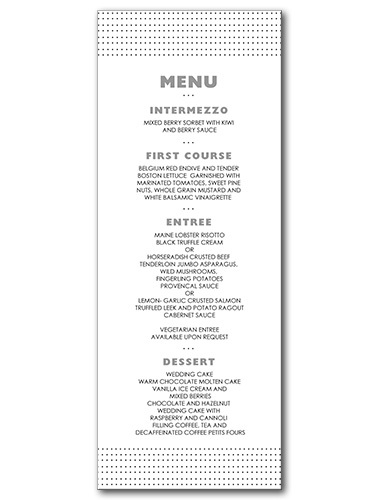 Simple dots are displayed throughout this fun menu design. It gives the appearance of delicate confetti, signaling to everyone that it's time to party. The interior rectangular area provides plenty of space for your personalized message, and you can easily choose your own wedding font for a unique look that is all your own. The simple black and white hues also make this an ideal design for a wide range of wedding themes. Find additional stationary, like table cards and response cards, to complete your ensemble. Petite Confetti Menu For the best experience, we recommend personalizing your stationery on a desktop computer.